GROSSMONT COLLEGE — When the power outage began approximately 3:40 p.m., Thursday, it was uncertain whether this was just a momentary interruption in service, or whether it was a major event. Assuming the former, photography instructor Patricio Chavez moved with his students from the classroom to the hallway of the Digital Arts Building, where he completed his lecture. Eventually, however, it became clear that the interruption might last for a day or more and Grossmont College decided to cancel classes for the rest of Thursday and for Friday as well. Buildings emptied, leaving vacant hallways such as this one in the Digital Arts Building where only a short time before Chavez had conducted his class. Campus roadways, however, were anything but empty as traffic backed up. Without electricity, traffic signals did not work, causing drivers to treat intersections around the campus as if they had four-way stop signs. Add to that, the rush of students, staff and faculty all attempting to leave Grossmont at the same time, and the result was a monumental back-up. 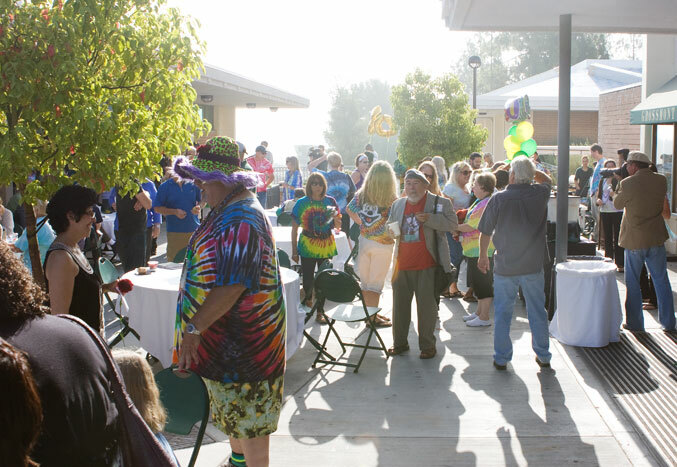 GROSSMONT COLLEGE — Last year it was unusual slippers, this year it was tie-dyed clothing, as faculty and staff came together for fun and learning in the week prior to classes. 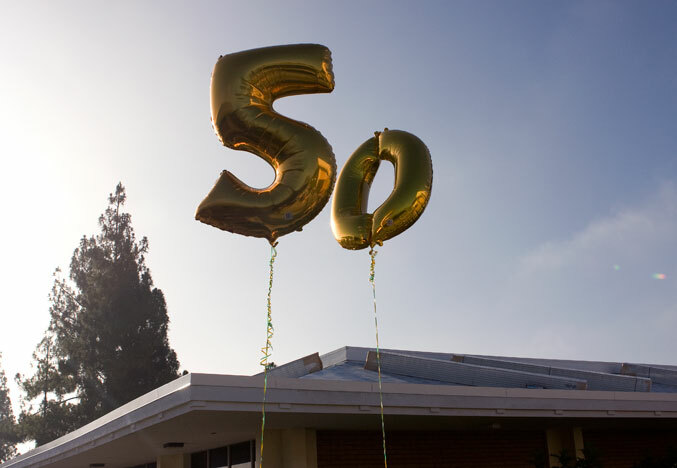 Their convocation featured a motivational speaker and a celebration of the 50th anniversary of Grossmont College’s founding. The morning scene in front of the gymnasium, where refreshments preceded the formal proceedings, seemed a flashback to the 1960s, with tie-dyed outfits recalling the era of hippies, flower children and peace signs. LA MESA–Marking the 100th anniversary of American Film Manufacturing Company’s arrival to La Mesa Springs, the La Mesa Historical Society along with Mayor Art Madrid paid tribute to the “Local Hollywood Stop” in Downtown La Mesa by the dedicating of a Flying A Movie Centennial Plaque. Director Allen Dwan brought the Flying A Film Company to La Mesa for interior photography and cinematography. Dwan used the set and many local areas to create his popular “one reeler” brand of western films. Later, upon moving Flying A to Santa Barbara, Dwan worked with some of the industry’s biggest stars, including Shirley Temple and John Wayne. After its dedication on August 8, the Flying A Movie Centennial Plaque now hangs proudly on the side of Mostly Mission as part of La Mesa’s local history. Check it out on the corner of La Mesa Blvd and 3rd st; and enjoy the great food and entertainment of our own Little Hollywood, Downtown La Mesa. Sanchez is Photo Editor of the GCSummit. GROSSMONT COLLEGE –A day after a storm in March, cement walkways throughout the campus were slick with cold, still puddles and covered with gritty dirt and leaves abruptly separated by the wind from trees. You could even feel the brisk chill breeze shifting through hallways. With the skies clearing, and the sun peeking its warmth through the dark, diffuse clouds, Grossmont College had fresh, crisp lighting glimmering off its railings, illuminating the leftover droplets.